Sharks and their lesser-known cousins the rays have been featured repeatedly in the news the past two years and fortunately not only in regards to incidents between sharks and people. The world is finally learning that many populations of sharks and rays are in global decline as a result ofexcessive fishing pressure, with tens of millions of sharks and an unknown quantity of rays captured yearly as bycatch to the tuna and swordfish fisheries and as targeted catch to supply the voracious demands of the Asian fin soup market and the Lenten season’s requirement for white meat. 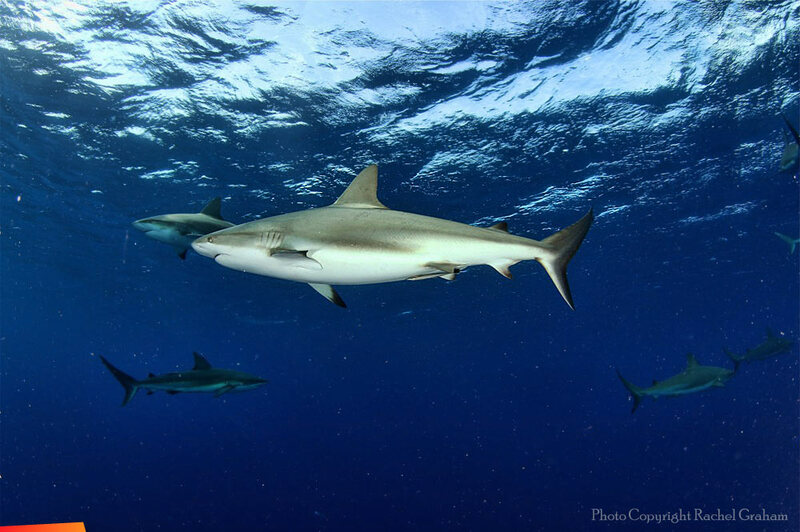 What many do not know is that through their role as apex predators in the food chain, sharks and rays (collectively known as elasmobranchs) are vital components of healthy and functional marine ecosystems and commercial fish stocks. They play key roles in structuring fish communities and fostering reef resilience against the relentless impacts of algal overgrowth, climate change and possibly even ocean acidification. These animals’ life history characteristics such as slow growth, late maturity and low fecundity (ability of produce offspring) increase their vulnerability to overexploitation and therefore indicate a dire need for management. The unfortunate news is that we are racing against time as populations dwindle to find out as much as we can about these charismatic animals and best forge effective and rational conservation strategies for their survival. Belize has been relatively pro-active in shark conservation: Gladden Spit and Silk Cayes Marine Reserve were the first Marine Protected Areas (MPA) declared to encompass critical shark feeding habitat and enforce regulations related to the management of whale sharks (Rhincodon typus) in 2000 and Hol Chan expanded it’s boundaries to include Shark Ray Alley. The nurse shark (Ginglymostomacirratum) was added as a protected species in July 2011, and eight of the 13 MPAs now include management actions for the conservation of sharks and rays. While Belize still possesses sharks and rays and much of the habitat considered essential for elasmobranchs, overfishing and uncontrolled development in nursery habitats are rapidly impacting our local populations. A broad survey of sharks in the south has already revealed that once abundant hammerheads, lemon and tiger sharks are now rare. More alarming is the news that the country’s two species of sawfish have not been reliably sighted in over 15 years suggesting that these species are now ecologically, if not locally extinct. A rapid assessment of the Spanish Point coast (behind Ambergris Caye) that is increasingly being targeted by Guatemalan net fishers was conducted by Wildlife Conservation Society, Wildtracks and fishers from the coastal fishing town of Sarteneja in 2010. Results suggest the existence of pupping and nursery grounds for the longnose stingray (Dasyatisguttata) and the virtually unknown Caribbean whiptail stingray (Himanturaschmardae), both categorized as International Union for Conservation of Nature (IUCN) Data Deficient and increasingly targeted by fisheries as sharks disappear. We also identified the first nursery area in Belize and the Mesoamerican region for bull sharks (Carcharhinus leucas), a Convention on International Trade in Endangered Species of Wild Fauna and Flora (CITES) species of concern. Local fisher interviews revealed the existence of nurseries for the Red Listed Endangered great hammerhead (Sphyrnamokarran), bonnethead (S. tiburo), tiger sharks (Galeocerdocuvier), and the possible existence of the Critically Endangered smalltooth sawfish (Pristis pectinata). Sharks and rays were estimated to generate at least US$750,000 in 2008 through protected area receipts at Hol Chan alone, and a minimum of US$4 million generated by all shark-related tourism (including whale sharks at Gladden Spit and Caribbean reef sharks at the Blue Hole) thereby demonstrating a strong incentive to keep sharks and rays alive in Belize. Therefore there is an urgent need to characterize and protect poorly known yet critical shark populations and shark nurseries in northern Belize. The northern Belize assessment will gather information on the populations and diversity, critical habitats and behavior of sharks and rays in the Corozal Bay out to the contiguous Bacalar Chico Marine Reserve (both transboundary with Mexico) and down the coast and barrier reef level with Robinson Point, south of Belize City. The study also includes Lighthouse Reef Atoll, Belize’s most remote coral reef site encompasses two of the country’s high profile MPAs; Blue Hole Natural Monument and Half Moon Caye Natural Monument, where our long-term monitoring of shark populations takes place. We are using a variety of tools and techniques to study sharks including in-water transects to survey rays, baited remote underwater video installations, a range of tag types (conventional, acoustic and satellite tags) to study behavior and spatial ecology of tagged species and fisher and public surveys on perception and knowledge. We are fortunate to work in the north with a range of partners including stakeholder communities, Fisheries, Forestry, Marine reserve staff, tour guides and operators, fishers and non-governmental organizations such as the Belize Audubon Society, Sarteneja Association for Conservation and Development, Green Reef, Wildtracks and Blue Ventures. This assessment forms part of the Wildlife Conservation Society’s broader Belize Shark Project that aims to foster the effective conservation of elasmobranchs throughout Belize, primarily through the lens of targeted legislation and the current network of 13 marine protected areas. 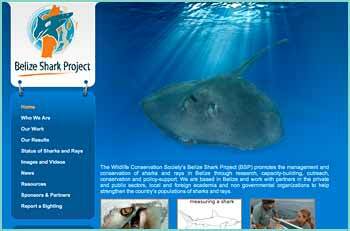 Key objectives include baseline studies on sharks and rays, their behavior and role in the ecosystem, raising awareness, capacity building in research methods as well as assessing the scope and impact of the fishery and providing policy support to help enact effective management of elasmobranchs in Belize and abroad. We have our work cut out for us to ground true fish accounts, gain an understanding of these vulnerable species and use these findings to support their effective management. We look forward to providing you with updates of our research, outreach and conservation results through articles in The San Pedro Sun and postings on our Belize Shark Project website www.belizesharks.org and Facebook page. We will also be presenting on sharks and rays at the Caye Caulker Community Center at 7pm April 10th and the San Pedro Lion’s Den at 7pm on April 11th. Look forward to seeing you there!